The role of chondrocytes in the development of infectious arthritis is not well understood. Several examples of mycoplasma-induced arthritis in animals indicate that chondrocytes come into direct contact with bacteria. The objective of this study was to analyze the interaction of an arthrogenic Mycoplasma synoviae strain WVU 1853 with chicken chondrocytes. We found that M. synoviae significantly reduces chondrocyte respiration. This was accompanied by alterations in chondrocyte morphology, namely cell shrinkage and cytoplasm condensation, as well as nuclear condensation and formation of plasma membrane invaginations containing nuclear material, which appeared to cleave off the cell surface. In concordance with these apoptosis-like events in chondrocytes, transcription was increased in several pro-apoptotic genes. Twenty-four hours after infection, strong upregulation was assayed in NOS2, Mapk11, CASP8 and Casp3 genes. 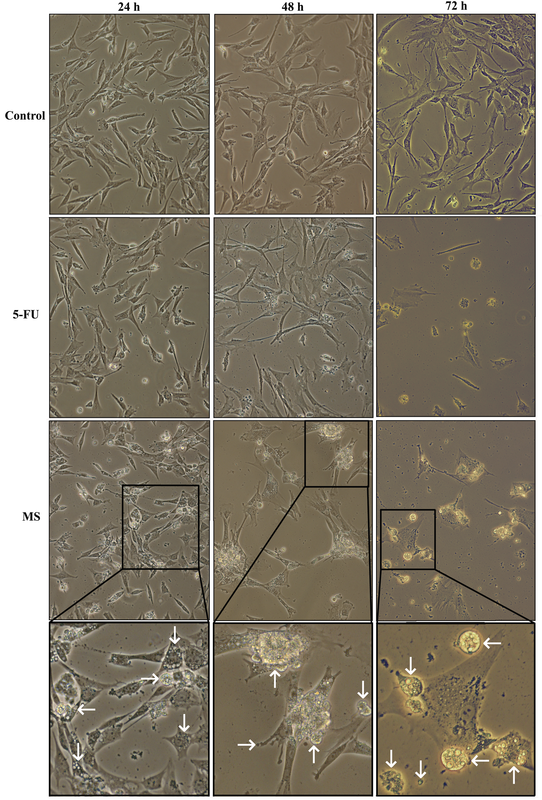 Twenty-four and 72 h incubation of chondrocytes with M. synoviae induced upregulation of AIFM1, NFκB1, htrA3 and BCL2. Casp3 and NOS2 remained upregulated, but upregulation ceased for Mapk11 and CASP8 genes. Increased production of nitric oxide was also confirmed in cell supernates. The data suggests that chicken chondrocytes infected with M. synoviae die by apoptosis involving production of nitric oxide, caspase 3 activation and mitochondrial inactivation. The results of this study show for the first time that mycoplasmas could cause chondrocyte apoptosis. This could contribute to tissue destruction and influence the development of arthritic conditions. Hence, the study gives new insights into the role of mycoplasma infection on chondrocyte biology and development of infectious arthritis in chickens and potentially in humans. Species from the genus Mycoplasma have long been recognized as important pathogens that cause diseases of the respiratory tract, urogenital tract and joints in a variety of animal species, including humans. Mycoplasma synoviae (M. synoviae) is a common pathogen of chickens and turkeys. It usually colonizes the respiratory tract, although this condition can lead to the development of systemic infection and/or infectious synovitis [1–4]. Experimental infectious synovitis has been associated with the hemagglutination-positive phenotype of M. synoviae. The condition is presented as an acute joint swelling accompanied by increased volume of synovial fluid, infiltration with macrophages, B and T cells, lining cell hyperplasia and fibroblastic proliferation. In the acute phase of infection, live M. synoviae have been detected in synovial fluids of infected birds, suggesting that M. synoviae can come into direct contact with chondrocytes as is the case with M. pulmonis and M. artritidis. M. synoviae has been reported capable of invasion into non-phagocytic chicken cells including chondrocytes in vitro. Mycoplasmas have been reported in many studies as active players in host-pathogen interactions leading to alterations in cell death patterns (Table 1) [9–22]. To our knowledge, there has been no report of any Mycoplasma species having apoptosis modulating effects on infected chondrocytes. Therefore, we conducted this study to elucidate the impact of Mycoplasma synoviae infection on chicken chondrocytes. Mycoplasma species with reported roles in apoptosis modulation. Induces apoptosis in human carcinoma cell line AZ-521 by activation of NOS2 and caspase 3. Inhibits proliferation without apoptosis or effect on function of lymphocytes and peripheral blood mononuclear cells. Induces apoptosis of bovine lymphocytes. Reduces TNF-induced apoptosis upstream of caspase 8 in a myelomonocitic cell line. Prevents apoptosis of 32D cells by inducing NFκB gene upregulation. Promotes immortalization of human peripheral blood mononuclear cells in culture. Promotes proliferation of synovial fibroblasts. Promotes CD95 expression and apoptosis of primary cardiac fibroblasts through modulation of CD44 receptor. Induces cell death in HeLa cells (through ATP release) and in 32D cells. Mediates NFκB activation in mouse macrophages and induces apoptosis. Prevents apoptosis of 32D cells by inducing NFκB. Inhibits apoptosis of cells expressing toll-like receptors 2/6 by inducing constitutive NFkB activation and p53 suppression. Suppression of tp53 gene induces carcinogenic and mutagenic effects on rodent fibroblasts. Does not affect 32D cells. Induces apoptosis in human monocytes THP-1 by activating NFκB. Supports continous growth of 32D cells. Apoptosis is a highly regulated process of cell demise and is generally induced through activation of different components of two overlapping signaling pathways. 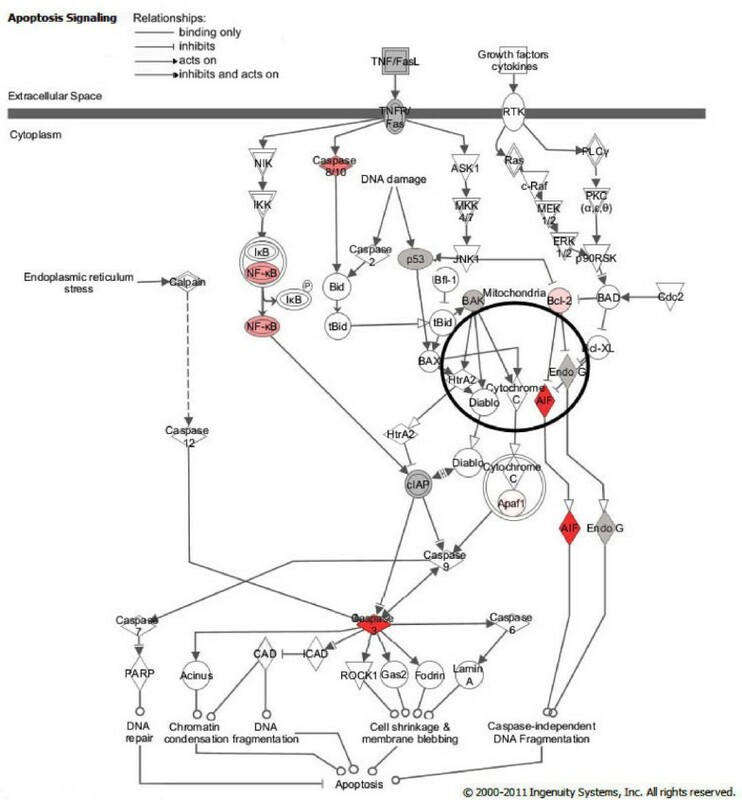 The extrinsic pathway includes the activation of death receptors leading to activation of a family of cysteine proteases known as caspases . Proteolytic cleavage of around 400 caspase substrates that have been identified so far  leads to phenotypic features of apoptosis. These include rounded morphology, condensed cytoplasm, fragmented organelles and formation of plasma membrane blebs that are separated from the cell into independent vesicles known as apoptotic bodies (reviewed in ). The intrinsic pathway is linked to stress signals from within the cell. It involves cleavage of Bid into tBid leading to activation of Bax and Bak1. They form a pore in the outer mitochondrial membrane and cause the release of proteins from the mitochondrial intermembrane space (endonuclease G, AIFM1, cytochrome c etc.) leading to execution of either caspase independent DNA cleavage (AIFM1, endonuclease G)  or the formation of apoptosome and activation of caspase 3 [27, 28]. One of the key players in the induction of apoptosis of articular chondrocytes in humans is nitric oxide (NO), which is produced by immune cells in the synovium and pannus as well as by activated chondrocytes [29–32]. NO induces apoptosis through p38 MAP kinase (MAPK11) mediated stimulation of caspase 3 activity and accumulation of nuclear factor kB (NFkB). This leads to increased expression of p53, a signaling molecule that acts upstream of caspase 3 [33, 34], as well as upregulation of pro-apoptotic Bax. Another mechanism of apoptosis in arthritic cartilage includes activation of CD95 (Fas) death receptor leading to upregulation of Fas ligand and p38 MAP kinase . In this study, M. synoviae infected chicken chondrocytes (CCH) were evaluated during three days for changes in cell viability, morphology and expression of genes associated with apoptosis. Chicken chondrocytes (CCH) were obtained from hyaline cartilage of hock joints as described previously . Primary cultures of CCH were cultivated up to the sixth passage in Dulbecco Modified Eagles Medium (DMEM), supplemented with 7.5% fetal bovine serum (FBS) and 2.5% chicken serum (all from Sigma-Aldrich, Munich, Germany). Cells were incubated at 37°C in a 5% CO2 incubator. Jurkat cells (ATCC, CCL TIB 152, kindly donated by Prof Nataša Kopitar Jerala, Jožef Stefan Institute, Slovenia) that overexpress death receptors were used as a positive control for apoptosis. Cells were cultivated in DMEM supplemented with 10% FBS and incubated at 37°C in a 5% CO2 incubator. Cultures of M. synoviae type strain WVU 1853 (approximately 20 in vitro passages before being used in this study) were grown in Frey mycoplasma broth as described previously . Bacteria in the logarithmic phase of growth were used for CCH infection. The number of colony forming units (CFU) was determined as described previously . To perform the cell viability test, CCH were seeded into 96 well plates (Corning, New York, USA) at density 5 × 105 cells/mL and incubated overnight at 37°C in a 5% CO2 incubator prior to infection. M. synoviae broth culture in the logarithmic phase of growth was used to infect CCH in a ratio of 10-100 M. synoviae CFU per CCH. As a positive control of apoptosis, 5-fluorouracil was used (5-FU, final concentration 20 μg/mL, from Sigma-Aldrich, Munich, Germany). Non-infected CCH were used as negative controls. As additional controls of the experiment, Jurkat cells, seeded at density 5 × 105/well, were subjected to the same three procedures. Tetrazolium-based dye XTT (Sigma-Aldrich, Munich, Germany) was added to wells after 0, 24, 48, 72 and 96 h of incubation. The final concentration of XTT in cell suspensions was 20%. Following 3 h of incubation at 37°C in a 5% CO2 incubator, absorbance of the samples was measured at 492 nm. The background signal was measured at 690 nm. The test was performed in three independent experiments with triplicates of each experimental condition. Average absorbances were calculated using MS Excel. Student t-test for independent values was used for determining statistically significant differences (p < 0.05). Morphological changes were observed by phase contrast and confocal fluorescence microscopy. CCH were seeded onto cover slides at density 5 × 105 cells/mL and incubated overnight. The cells were then infected with M. synoviae as described and incubated for 24 h, 48 h and 72 h followed by phase contrast microscopy examinations for morphological changes. Additionally, distribution of CD44 receptor (hyaluronan receptor; its cross-linking augments Fas expression and subsequent Fas-mediated apoptosis of the cells ), and nuclear condensation were observed using confocal fluorescence microscopy. The medium was aspirated, and CCH were washed in sterile phosphate buffered saline (PBS). The cells were fixed using a pre-cooled mixture of acetone and methanol (both from Sigma-Aldrich, Munich, Germany) for 10 min at room temperature. A solution of 10% goat serum (Sigma-Aldrich, Munich, Germany) was used for blocking (1 h, room temperature), followed by 3 washes in PBS containing 0.5 mg/mL RNase (Sigma-Aldrich, Munich, Germany). Mouse monoclonal antibodies to chicken CD44 (DSHB, Iowa City, USA), diluted 1:100 in PBS were added for 1 h at room temperature. After washing, Alexafluor-488 goat anti-mouse IgG antibodies, diluted 1:2000 (Life Technologies - Invitrogen, Carlsbad, USA), were used as secondary antibodies. After 1 h at 37°C, unbound antibodies were washed off, and nuclei were labeled for 5 min in propidium iodide (Sigma-Aldrich, Munich, Germany) in PBS with 0.1% Triton X-100 and 0.5 mg/mL RNase (both from Sigma-Aldrich, Munich, Germany). Following washing in PBS, cover slides were mounted using Dako Fluorescence Mounting medium (Dako, Glostrup, Denmark) and viewed using a Leica TCS SP5 confocal microscope (Leica Microsystems, Mannheim, Germany). In order to perform gene expression analysis, CCH were seeded into 75 cm2 flasks (Techno Plastic Products, St. Louis, USA) at density 5 × 105 cells/10 mL and incubated overnight. The cells were then treated as described for the XTT assay and sampled by trypsinization after 24, 48 and 72 h of incubation. CCH were washed in sterile PBS followed by isolation of total RNA using RNeasy Mini Kit (Qiagen GmbH, Hilden, Germany). RNA concentration was determined spectrophotometrically using NanoVue (GE Healthcare, Waukesha, USA). Subsequently, RNA was stored at -80°C. Residual DNA was eliminated by incubating 1 μg of RNA with 1U of RNase-free DNase I in a buffer containing MgCl2 ions (both from Thermo Fisher Scientific - Fermentas, St. Leon-Rot, Germany) for 30 min at 37°C. Following DNase inactivation at 65°C, cDNA was synthesized using a High-Capacity cDNA Reverse Transcription Kit (Life Technologies - Applied Biosystems, Foster City, USA), according to the manufacturer's instructions. cDNA was stored at -20°C immediately after reverse transcription reactions. Prior to use, primer pairs were checked for specificity in silico using NCBI Primer BLAST . Primer efficiency was checked on each primer pair using dilutions of cDNA combined from all experimental conditions and timepoints. For RT-qPCR reactions, 20 μL mixtures were made, containing 10 μL of Power SYBR Green PCR Master Mix (Life Technologies - Applied Biosystems, Foster City, USA), 0.5 μL of forward and 0.5 μL of reverse primer (final concentration 5 μM, Integrated DNA Technologies, Leuven, Belgium), 8 μL of DEPC-treated water (Qiagen GmbH, Hilden, Germany) and 1 μL of cDNA. Stratagene Mx3000P (Agilent Technologies - Stratagene, Santa Clara, USA) was used to perform RT-qPCR reactions and its MxPro software for analysis of amplification and dissociation plots. Reaction conditions were set to 10 min at 95°C (first segment, one cycle), 15 s at 95°C and 1 min at Tm of a specific primer pair (second segment, 40 cycles) followed by one cycle with 15 s at 95°C, 30 s at Tm and 15 s at 95°C (dissociation curve segment). Gene expression was analyzed for 15 genes (Table 2, ), and GAPDH was used as a reference gene . Gene expression values of non-infected CCH were used for gene expression calibration. Appropriate controls (no template and no reverse transcription control) were also performed in each run. A list of oligonucleotides used as primers in RT-qPCR analysis of gene expression in chicken chondrocytes. Caspase 3: apoptosis related cysteine peptidase from the group of effector caspases. Bcl2 antagonist/killer: pro-apoptotic member of the Bcl2 family, involved in mitochondrial pore formation. Fas: TNF receptor superfamily, member 6. Fas ligand: TNF superfamily, member 6. Tumor protein p53: tumor suppressor, activator of apoptosis through induction of BAX expression. Apoptosis-inducing factor: pro-apoptotic mitochondrial protein, responsible for caspase-independent DNA cleavage. Caspase 8: apoptosis related cysteine peptidase from the group of initiator caspases. B-cell CLL/lymphoma 2: anti-apoptotic member of the Bcl2 family, blocks mitochondrial pore formation. Endonuclease G: mitochondrial endonuclease, released from mitochondria during apoptosis. X-linked inhibitor of apoptosis: a nti-apoptotic protein from the IAP family, blocks caspase 3 activation by inhibiting caspase 9. Nitric oxide synthase 2, inducible: pleiotropic immune system regulator, inducer of apoptosis in chondrocytes. Nuclear factor of kappa light polypeptide gene enhancer in B-cells 1: transcription factor with pro- or anti-apoptotic functions. CD44 molecule (Indian blood group): hyaluronan receptor, involved in interaction of the cell with the extracellular matrix, capable of inducing caspase-independent death via calpain-dependent AIF release. Crosslinking of CD44 augments Fas expression and mRNA transcription. HtrA serine peptidase 3: mitochondrial serine peptidase, inhibits XIAP. Mitogen-activated protein kinase 11: stimulates caspase 3 activity, NFκB expression and p53 expression and protein stability. Glyceraldehide-3-phosphate dehydrogenase: enzyme in carbohydrate metabolism. Three independent experiments were performed to collect RNA for RT-qPCR. Relative gene expression was assayed in each experiment and experimental condition separately. Three repeats of each RT-qPCR reaction were performed. Normalized relative quantities were calculated using the efficiency corrected 2-ΔΔCq method . The effect of intra-assay variation on the statistical significance of the results was reduced by log transformation of normalized relative quantities, mean centering and autoscaling as described in . Statistical significance of the results was determined using the Student t-test (p < 0.05) and statistically significant results visualized through Ingenuity Pathways Analysis platform (Ingenuity Systems, Redwood City, USA). In order to determine the concentration of NO, an experiment equal to XTT-based cell proliferation test was set up using CCH. After 24, 48 and 72 h of incubation, supernates were transferred to a sterile 96-well plate and assayed immediately using the Griess assay (R&D Systems, Minneapolis, USA). The concentration of NO was determined based on the standard curve and absorbances of the azo-compound NO forms in the reaction with sulfanilamide and N-1-naftyletylendiamin dihydrochloride. Absorbances were read at 550 nm (background at 630 nm). Two independent experiments with three replicates of each condition were performed and mean absorbances ± standard errors were used to test statistical significance of the results (Student t-test, p < 0.05). We assayed the respiration of CCH by determining the relative decrease in reduction of tetrazolium salt XTT in M. synoviae infected CCH compared to the negative control. As a positive control, CCH were treated with 5-FU. Jurkat cells were used as an additional positive control. M. synoviae infection caused significant decrease in CCH respiration, indicating reduced viability. This effect was noticed 72 h and 96 h after infection (p ≤ 0.1) (Figure 1). An even stronger decrease in respiration, already after 24 h, was noticed in CCH treated with 5-FU (Figure 1). Jurkat cells responded stronger than CCH to both treatments, with a major decrease in cell respiration apparent already after 24 h in both cases (p < 0.01) (Figure 1). 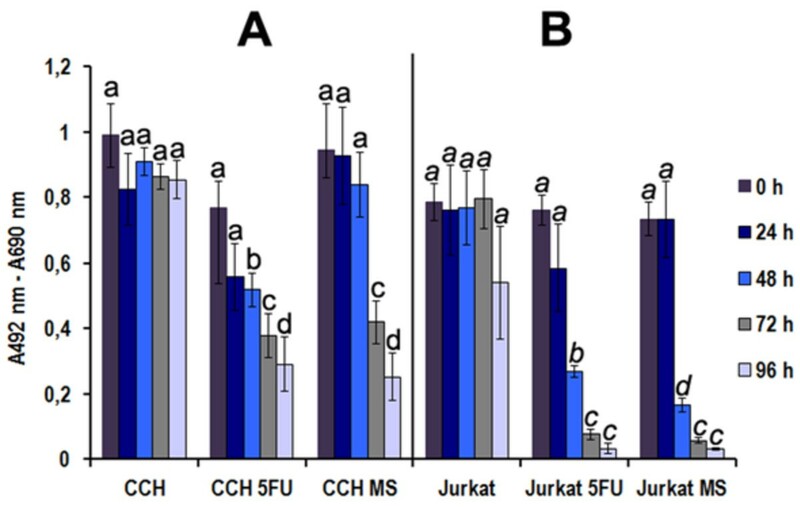 Fresh medium was not added to any of the cells at the time of measurements, resulting in a decrease in viability of fast-growing Jurkat cells even in negative controls after 96 h (Figure 1). Cell respiration (viability) of control cells, cells treated with 5-fluorouracil (5-FU) or infected with M. synoviae. CCH or Jurkat cells were treated for indicated time periods and assayed using the XTT-based cell viability test. The results are presented as mean values ± standard error for three independent experiments with three replicates each. Means with a different letter are different (p < 0.05 to p < 0.001) by the Student t-test. Phase contrast microscopy of infected CCH revealed dramatic changes in cell morphology (Figure 2). Twenty-four hours after infection with M. synoviae, some CCH were shrinking. Plasma membranes appear rough but formation of membrane vesicles was not noticed. The cytoplasm of infected cells shows increased vacuolization. However, the number of cells that adhered to cover slides was roughly comparable to the control (Figure 2). Longer exposure to M. synoviae resulted in more pronounced vacuolization of cytoplasm and formation of membrane blebs seen 48 h after infection (Figure 2). After 72 h, cytoplasm vacuolization was present in some of the uninfected CCH, to which no fresh medium was added after seeding into plates. Still, most cells were attached to cover slides. In contrast, only a few cells infected with M. synoviae remained attached to cover slides (Figure 2). The remaining ones exhibited excessive membrane blebbing with individual vesicles detaching from cells or cytoplasm condensation (cell shrinkage) and/or vacuolization (Figure 2). In CCH treated with 5-FU, membrane roughness and cell shrinkage was noticed after 24 h, but with no cytoplasm vacuolization present. A similar morphology was observed 48 h after treatment, but in a larger number of cells. The number of cells still attached to the surface was lower than in the control slide and some cells presented with membrane blebs. Seventy-two hours of treatment with 5-FU caused cell death and detachment from cover slides in most cells, with remaining cells presenting similar morphological features as those infected with M. synoviae (Figure 2). Cytopathological changes in control CCH, CCH treated with 5-fluorouracil (5-FU) or infected with M. synoviae. CCH were seeded onto cover slides and incubated overnight followed by treatment with 5-FU or infection with M. synoviae and incubation for 24 h, 48 h and 72 h. In each timepoint, cells were observed for morphological changes by phase contrast microscopy (400 × magnification). Typical examples of chondrocyte morphology after infection with M. synoviae are shown in magnification. Vacuolization and indications of membrane blebbing are indicated by arrows. Confocal microscopy of infected CCH labeled with antibodies to membrane receptor CD44 and propidium iodide revealed additional changes caused by M. synoviae infection (Figure 3). The nuclei of negative controls stained evenly with PI after all three timepoints, while brighter foci indicating condensed DNA were present in CCH infected with M. synoviae. Additionally, vesicles detaching from the blebbing CCH plasma membrane contained condensed DNA. Differences in CD44 receptor abundance and distribution were not obvious in CCH infected with M. synoviae. CCH treated with 5-FU appeared to express more CD44 (Figure 3). Morphological and other changes in untreated CCH, CCH treated with 5-fluorouracil (5-FU) or infected with M. synoviae. CCH were seeded onto cover slides and incubated overnight. Cells were then treated with 5-FU or infected with M. synoviae and incubated for 24 h, 48 h and 72 h followed by fixation in an acetone-methanol mixture, blocking and labeling with mouse antibodies to chicken CD44. Alexafluor-488 goat antibodies to mouse IgG were used as secondary antibodies and nuclei were labeled with propidium iodide. Nuclear condensation and formation of blebs containing nuclear material are indicated by arrows. Expression of 15 genes (Table 2) was assayed in CCH exposed to 5-FU or infected with M. synoviae. The level of expression was normalized to untreated control cells and calibrated with reference to GAPDH expression. Upregulation of several genes was already observed in the cells sampled 24 h after infection. The gene encoding inducible nitric oxide synthase (NOS2) was upregulated 46-fold (p < 0.001), Casp3 was upregulated 2.6-fold (p < 0.001), Mapk11 3.2-fold (p < 0.01) and CASP8 2.9-fold (p < 0.01) (Figure 4). In CCH infected with M. synoviae for 48 h, Casp3, NOS2 and Mapk11 remained upregulated (2.8-fold, 20.1-fold and 3.1-fold, respectively, p < 0.001), while another gene, htrA3, became slightly upregulated (1.6-fold, p < 0.01) (Figure 4). Seventy-two hours after infection, Casp3 and NOS2 remained upregulated (4.4-fold and 7.7-fold, respectively, p < 0.001), while Mapk11 was no longer upregulated. A strong increase in transcription was noticed in genes AIFM1 (6.7-fold, p < 0.001), NFκB1 (2.5-fold, p < 0.001) and htrA3 (2.7-fold, p < 0.001). BCL2 was also upregulated (2-fold, p < 0.001) (Figure 4). No change in gene expression at all tested timepoints was noticed for Bak1, endog, tp53, CD44, XIAP, Fas and FASLG (Additional file 1, Figure S1). Expression of selected genes after exposure of CCH to 5-fluorouracil or M. synoviae WVU 1853. Exposure agent and time of exposure (in hours) are indicated below columns. Control (CTRL) represents in all graphs non-exposed CCH. The results are given as mean values ± standard error for three independent cell treatment experiments with three RT-qPCR replicates for each experiment. Means marked with stars are significantly different from controls (p < 0.05 to p < 0.001) by Student t-test. CCH treated with 5-FU revealed a pattern of gene expression that differed considerably from that of CCH infected with M. synoviae. As indicated by the XTT test and morphological changes, the effect of 5-FU was more pronounced compared to M. synoviae, especially 24 and 48 h after treatment. After 24 h, strong upregulation was noticed in CD44 (11.3-fold, p < 0.001), AIFM1 (369.2-fold, 0.001), Fas (11.9-fold, p < 0.001), FASLG (4.3-fold, p < 0.05), NOS2 (3.1-fold, p < 0.01), and NFκB1 (2.4-fold, p < 0.01). Interestingly, the expression of XIAP was also elevated after 24 h (3.6-fold, p < 0.01). Increasing the incubation time to 48 h revealed a normalization of NFκB1, XIAP, AIFM1 and NOS2 expression together with upregulation of tp53 (1.8-fold, p < 0.05) and lower level of upregulation in CD44, Fas and FASLG (Figure 4). Seventy-two hours of incubation of CCH with 5-FU-supplemented medium left little living cells, in concordance with the results of the proliferation test and morphological observations, and these had only a few upregulated genes, including Fas (1.5-fold, p < 0.05), Bak1 (1.3-fold, p < 0.05), CASP8 (1.8-fold, p < 0.001) and Mapk11 (1.6-fold, p < 0.01) (Figure 4, Additional file 1, Figure S1). Interactions between proteins encoded by genes of interest, as well as levels of gene upregulation, were depicted using the Ingenuity Pathways platform (Figure 5). Ingenuity Pathway Analysis network depicting interactions between genes known to be involved in apoptosis induction. Two major pathways are shown, the death receptor (extrinsic) pathway, and mitochondria-dependent (intrinsic) pathway. Pink color of molecules indicates upregulation of genes analyzed in this study (level of upregulation after 24, 48 or 72 h of CCH exposure to M. synoviae), with darker shades of pink representing higher levels of gene upregulation. Grey color indicates no change in gene expression, whereas molecules that were not analyzed are white. Types of relationships are explained in the legend. The pathways depicted represent conserved pathways generated from knowledge published for different species. (Note that exceptions specific for avian species could be possible). Infection of CCH with M. synoviae induced a significant increase in NO production at all tested time points (p ≤ 0.01) (Figure 6), in agreement with the strong upregulation of NOS2. NO concentration doubled already 24 h after infection. During the next 48 h, the concentration of NO did not increase significantly compared to the concentrations assayed after 24 h.
Concentration of NO in culture media of CCH infected with M. synoviae for 24, 48 and 72 h. NO concentration was determined by the Griess assay. The results are presented as mean concentrations ± standard error for two independent experiments with three replicates each. Different letters above columns indicate significant differences between NO concentrations (Student t-test, p ≤ 0.01). In the research of rheumatoid arthritis etiology, the idea of a bacterial infection leading to arthritis is becoming increasingly popular [43–45]. Bacterial infections increase the production of NO, and can lead to inflammation. Inflammation then leads to chondrocyte apoptosis [30–35]. In cartilage tissue that is rich in extracellular matrix and with few cells in hard to reach places, clearance of dying cells is especially troublesome and can lead to the development and perpetuation of inflammation, which in turn leads to cartilage and bone degradation [46–48]. The idea of mycoplasmal infections, as the triggering factor of rheumatoid arthritis, has been revisited several times. Still, the role of mycoplasmas that have been detected in synovial fluids and serums of patients suffering from arthropathies remains unclear [49–54]. Factors impeding these studies are many. Because of their obligatory parasitism and complex nutritional demands, mycoplasmas are hard to cultivate. In addition, mycoplasmas adapt to the host in a way that induces subclinical infections that pass with little or no inflammation. Furthermore, mycoplasmal antigens, many of which are enzymes, can affect cells even after bacteria are dead and lysed, and their presence is difficult to detect by certain conventional methods . Mycoplasma species are also well known to cause arthritis in certain animal species, including chickens [1–7]. Experimental infections of chickens with M. synoviae WVU 1853 resulted in thinning of the articular cartilage 25 days post infection . Visible cartilage erosion appeared about two weeks later, presumably due to the presence of increasing numbers of heterophils. It seems likely that M. synoviae could also affect CCH. This assumption is supported by our observations that synovial fluids of chickens infected experimentally into hock joints contained antibodies to CCH and cartilage proteins (Dušanić et al., unpublished observations). This suggests CCH death and tissue destruction, leading to consequent production of autoantibodies against cartilage and CCH proteins. Many Mycoplasma species invade non-phagocytic cells and interfere with apoptosis (Table 1) [9–22]. M. synoviae is capable of invading CCH . The interactions between CCH and M. synoviae are likely to occur via binding of M. synoviae hemagglutinin VlhA to CCH receptors containing Sia (α 2-6) gal and Sia (α 2-3) gal, and their desialylation with M. synoviae neuraminidase [8, 56], Dušanić et al. unpublished observations]. Its effect on cell viability has, however, not been reported before this study. This is the first report of mycoplasma-induced apoptosis in chondrocytes. The XTT proliferation assay was performed on chicken chondrocytes infected with M. synoviae and a major decrease in cell respiration was noted, suggesting cell death had occurred (Figure 1). Chondrocyte morphology, evaluated under phase contrast microscope and confocal microscope combined with anti-CD44 receptor and propidium iodide staining additionally indicated cytopathology with apoptotic features in chondrocytes infected with M. synoviae (Figures 2 and 3). 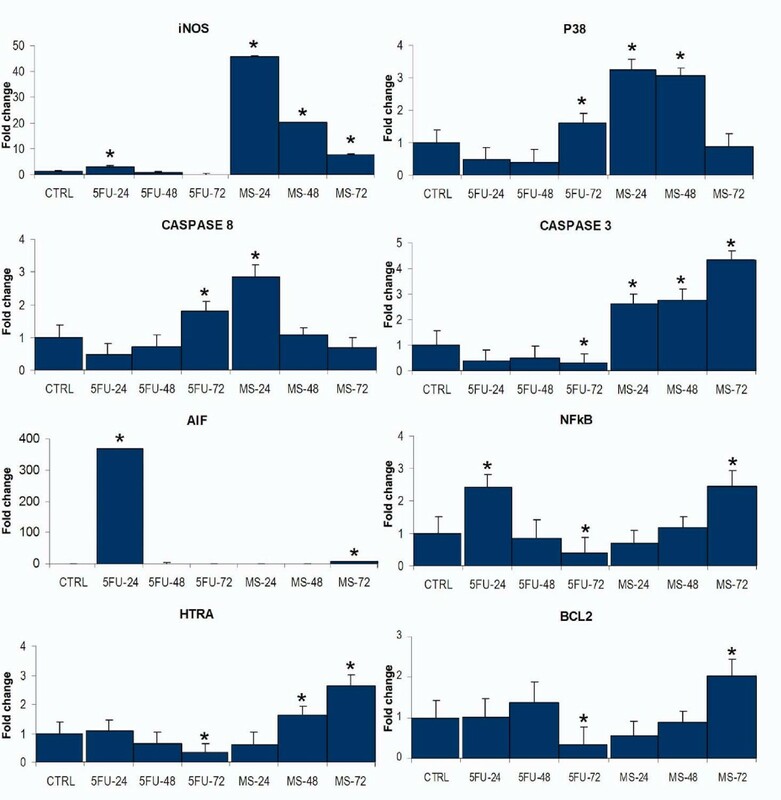 RT-qPCR analysis, performed on 15 genes involved in apoptosis (Table 2, Figure 4), involved NO production in apoptosis induction. The Griess assay confirmed secretion of NO to supernates (Figure 6). NO production is closely linked to chondrocyte apoptosis and cartilage loss in human arthropathies such as osteoarthritis and rheumatoid arthritis [30–33]. Also, NO production was shown to be strongly upregulated in chicken macrophages infected with M. synoviae or in contact with its lipoprotein MSPB . Both endogenously and exogenously produced NO is capable of inducing chondrocyte apoptosis, but the analysis here was limited to NO produced by chondrocytes as a result of M. synoviae infection. As expected, Mapk11 (encoding p38B, the major inducer of NO-linked apoptosis) was upregulated as well, 24 h and 48 h after infection. It has been reported that p38 causes upregulation and stimulation of caspase 3 activity, and upregulation of NFκB transcription factor [34, 35]. In our study, upregulation was noticed in genes encoding both caspase 3 and NFκB1, as well as in genes encoding other related apoptotic proteins (Figures 4 and 5). Increased transcription of caspase genes is the most probable explanation for the formation of apoptotic bodies and cell shrinkage in infected CCH . Although genes encoding endonuclease G, which is released from the mitochondria during apoptosis, and Bak1, a pro-apoptotic mitochondrial protein, were not upregulated, another mitochondrial nuclease, encoded by AIFM1, was strongly upregulated 72 h after infection, indicating mitochondrial involvement (Figures 4 and 5). Occurrence of Fas receptor mediated apoptosis, which has been reported in chondrocytes , was disregarded due to unchanged transcription of both Fas and FASLG during CCH infection with M. synoviae (Additional file 1, Figure S1). Apoptosis inhibitor, encoded by BCL2, was slightly upregulated after 72 h, but so was htrA3, encoding the inhibitor of Bcl2. The expression of another apoptotic inhibitor, encoded by XIAP, remained unaltered (Additional file 1, Figure S1). Taken together, our results indicate that M. synoviae induces endogenic nitric oxide mediated, caspase 3 and 8 dependent apoptosis in chicken chondrocytes, which involves a loss of mitochondrial function (Figure 5). 5-fluorouracil was used as a positive control of the experiment due to its well established apoptotic effect on other cell lines . 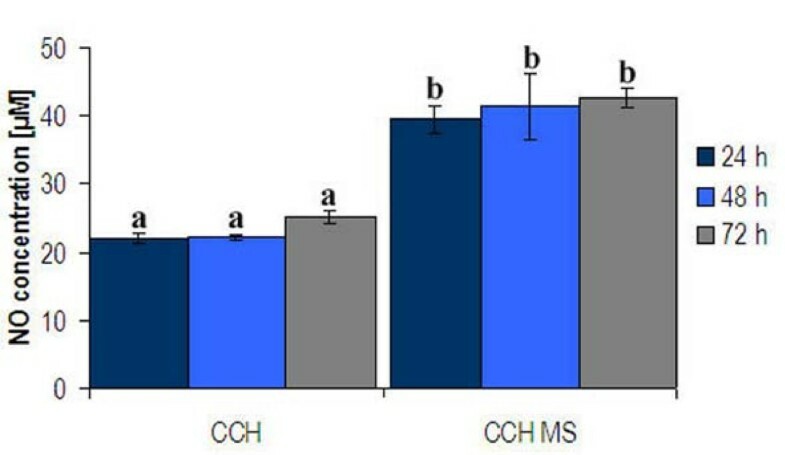 Compared to M. synoviae, it induced a stronger and faster apoptotic response in CCH (Figure 4, Additional file 1, Figure S1, Figures 2 and 3). The profile of gene expression modulations indicate a Fas receptor mediated, caspase 3 independent cell death involving mitochondrial inactivation. Interestingly, the Jurkat cell line that was used as a positive control of the viability test shows great susceptibility to M. synoviae infection (Figure 1). Although live intracellular M. synoviae were re-cultivated in our previous study 24 and 48 h after infection, the percentage of CCH invasion was relatively low (1.2 ± 0.3 for the type strain WVU 1853) . This study demonstrates a high susceptibility to cell death in infected chondrocytes. This suggests that M. synoviae affects CCH both from the outer side of the membrane, probably in a Fas independent manner, and from its location within the cell. It is also possible that mycoplasmas die in cell culture due to their complex nutritional demands, but their antigens continue to stimulate CCH and cause stress. 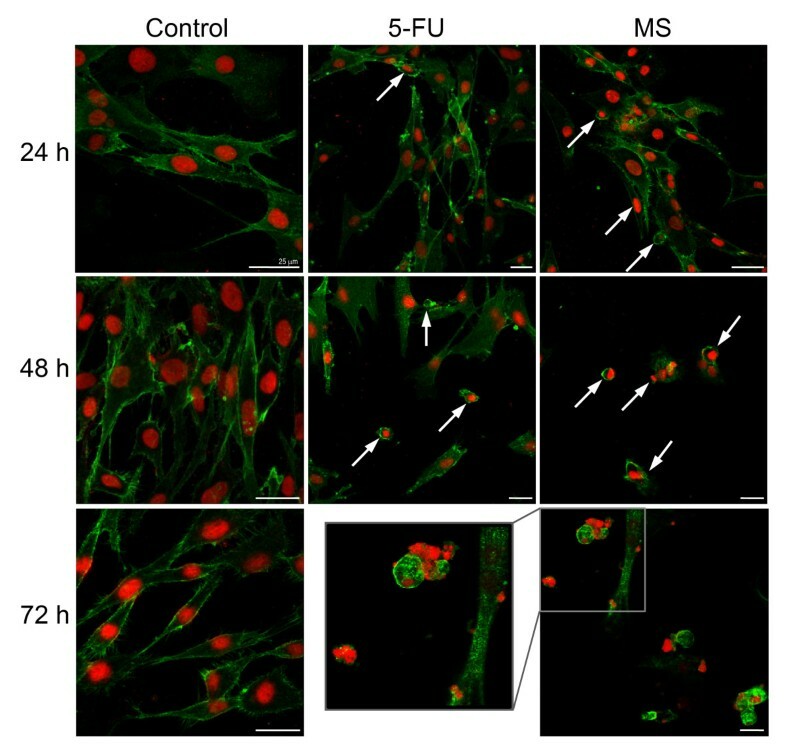 An example of macrophage stimulation to produce NO, IL6 and IL1β by M. synoviae lipoprotein MSPB has been reported previously . With the exception of caspase 3, patterns of apoptotic gene upregulation were not confirmed on the protein level due to the scarcity of the appropriate specific antibodies to chicken proteins or enzymes involved in apoptotic signal transduction cascades. Even with caspase 3, the antibody used was not specific enough to recognize the cleaved form of the protein (Additional file 2, Figure S2). Still, correlations between demonstrated cytopathologic changes, results of the XTT tests, Griess assay and gene expression data indicate apoptosis and not necrosis as the main mechanism of cell death. As an additional confirmation, CCH infected with M. synoviae were labeled using Annexin V-FITC (AV) and propidium iodide (PI) to discriminate between live (AV-PI-), early apoptotic (AV+PI-), late apoptotic (AV+PI+) and primary/secondary necrotic cells (AV-PI+). The results show an increase in the percentage of cells with phosphatidylserine exposed on the outer membrane layer, to which AV is bound, in the first two days of infection. This was followed by an increase in cells labeled only with PI, indicating secondary necrosis (Additional file 3, Figure S3). In conclusion, this study provides the first demonstration of mycoplasma-induced apoptosis of chondrocytes. This process may lead to the development of M. synoviae-induced infectious synovitis in the chicken, a disease that in many factors resembles human infectious arthritis. It also supports the hypothesis that mycoplasma-induced arthritic conditions in animals might be useful models for understanding the role of mycoplasmas in similar human diseases. Hence, the study may have value outside the immediate interest of avian arthritis. BH3 interacting domain death agonist (truncated form: tBid). This work was supported by grant 1000-07-310121 from the Ministry of Education and Science of the Republic of Slovenia. The authors would like to thank Dr Nataša Kopitar Jerala (Jožef Stefan Institute, Slovenia) for donating Jurkat cells, Iva Horvat for doing the proliferation assay and Ana Jakopič for technical assistance. DD conceived the study, carried out the isolation of CCH, infection of cells, RNA isolation and subsequent gene expression analysis, all microscopy and NO concentration assays, performed the statistical analysis and drafted the manuscript. DB carried out M. synoviae cultivation and CFU determination and participated in manuscript editing. IO advised DD on RT-qPCR and participated in manuscript drafting. IC participated in M. synoviae cultivation, determining the number of CFU and performing RT-qPCR. MB participated in performing confocal microscopy and flow cytometry analysis. MN participated in designing the study, drafting the manuscript and coordination between authors. All authors read and approved the final manuscript.